Sylvia Greenberg, soprano; Lynne Dawson, soprano; Sally Matthews, soprano; Sophie Koch, alto; Elena Manistina, alto; Robert Gambill, tenor; Detlef Roth, baritone; Jan-Hendrik Rootering, bass. It's a bit of a juggling act conducting Mahler's Eighth. The conductor must continually make balance and tempo decisions to fully exploit the choir, orchestra and soloists. 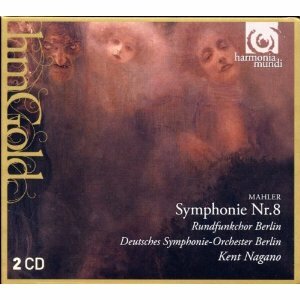 Or at least, that is the impression Kent Nagano gives in this re-released 2005 recording from Berlin. Rather than impose a single interpretive approach on the entire work, he focusses instead on the individual sections, often changing tempo quite suddenly at the start of a phrase to present it at an appropriate speed. He still keeps and eye on the bigger picture, although this is most apparent in the louder sections and the movement climaxes. But for the rest of the work, he tries hard to give the vocal soloists the space to lead the music. That is a sensible approach, which overcomes one of the main problems of the score, the over-orchestration of the solo music. Take, for example, the opening section. After the grand choral introduction there is a sudden gear shift at the first ensemble section for the soloists. On first listening this can be a little jarring, a sudden slowing that cuts against the work's symphonic credentials. But the sheer beauty of this section, and of later sections of solo singing, more than justifies the intervention. And in fact, the second section is much more symphonic anyway. The quiet introduction is taken very slow, and Nagano's idea seems to be to gradually build up through the movement to it's climax. Of course, there is a lot of drama and recitative type music to fit in along the way, but on the whole it works well. Nagano's collaborators do him proud. The choirs have a robust tone and good ensemble. The Deutsches Symphonie-Orchester Berlin are punchy and precise, the brass and woodwind tone sometimes a little angular perhaps, but that only improves the music's focus. The cast of soloists has a unified tone when required, yet each of them is able to distinguish themselves in terms of timbre and articulation for their individual solos. I find soprano Sylvia Greenberg's vibrato a bit heavy, and tenor Robert Gambill is a little prone to swooping around between the top notes. But otherwise the lineup more than justifies the space that Nagano makes for them in the music. The recorded sound is good but not exceptional. The Philharmonie in Berlin has hosted some of the finest sound recordings of recent decades, but sadly this isn't one of them. The sheer number of performers is perhaps the problem here, but the front of the stage, the soloists in particular, is far better served than the back. When this recording was first issued, in 2005, it was on SA-CD, so it is slightly concerning that only six years later it has reappeared in standard CD format. I'm confident though that Harmonia Mundi are not planning to give up on high definition audio technology anytime soon. In fact, their recent new releases include an impressively high number of SA-CDs. In this case, though, it seems that the recorded sound, serviceable as it is, did not warrant the expense going down that route for the budget reissue.